If you’re like most people, the first biological cell you ever saw was flat: a diagram in a book, or maybe a microscope image on a slide if you were lucky. Same goes for scientists. It’s hard enough to zoom in on something so small, much less capture a 3D image of the thing. As a result, it’s easy to imagine that there are a multitude of two-dimensional discs filling your blood vessels and fighting your infections. That’s why this new development is so eye-opening. Researchers have made an imaging breakthrough that lets them capture 3D footage of cells doing their thing inside the body — and it may look nothing like what you imagined. 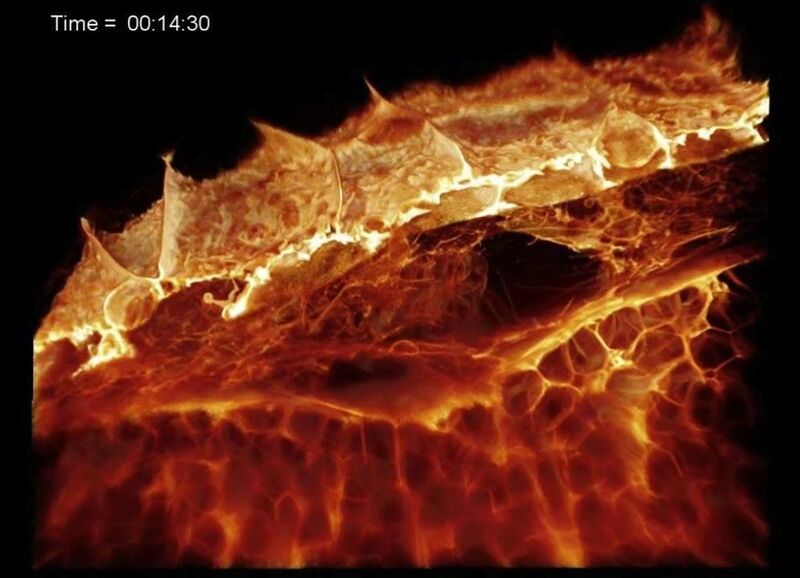 The video below depicts the inner ear of a zebrafish — you know, that little inch-and-a-half (4-centimeter) striped thing you see in pet store fish tanks? Suffice it to say, the objects in this footage are very, very small. Here, a fiery yellow immune cell rolls on through gobbling up bright-blue particles of sugar.